I am the Fairie of the Shoe. I left some magic here for you. For you will make it new! The Shoe Fairie has been a visitor to our family since way before my lifetime. Of course that’s when she began for me! As a little girl, growing up on the same street as most all of my cousins, we shared many family traditions. If any of us had a sleepover to each others’ house, the shoe fairie seemed to know we were there! Leaving out ONE shoe was truly part of our bedtime routine, especially when we spent the night at Grannie’s house at the top of Scuffle Hill! We knew from the start that she didn’t like a greedy child and would only visit in the night under two conditions: 1. that we went to bed early enough, 2. that we left out only one shoe…for we must share her resources and time with other children. Somehow the shoe fairie always knew what meant ‘magic’ to each child. For one it might be a special kind of ball, to another a shiny new pair of shoe strings, to another a very perfect acorn and cap… Some of the best for me were buckeyes for good luck, and any tiny little perfume bottles, empty or full! 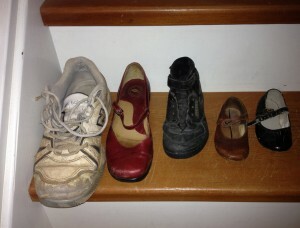 Tonight is one of those nights when the shoe fairy will come…for family is here and it’s a special night.The challenge for the shoe fairy is often a chronic one…that of having enough energy to stay awake and complete her job. For everyone must take off their shoes and leave one out, and then get in bed in time for her to come! We’ll see how she handles these late nighters! The Shoe Fairie also performs a kind service for the house. She often rummages through the drawers where extra stuff is stuffed. When things are cluttered in a drawer, they lose their magic. That part of them only comes to life when they are given away so that they can renew their meaning in someone’s life. Such is the way of the Shoe Fairie…to help ordinary things long forgotten been seen in new, extraordinary ways!